Now that the French infantry Route-March set is nearing completion, Peter F.’s attention returned to upgrading the Prussian musketeers prior to the traditional August holiday month. I’ll be adding details of these packs, as well as new pictures of some of the other new Prussians, to the Calpe website over the next week or so. These new charging figures include some really dynamic poses and caters for figures in both the front and rear ranks. So here we go – enjoy these photos! Pack P17: Prussian musketeers charging – front rank. Pack P18: Prussian musketeers charging – rear rank. Pack P19: Prussian musketeers charging – front rank head variants. 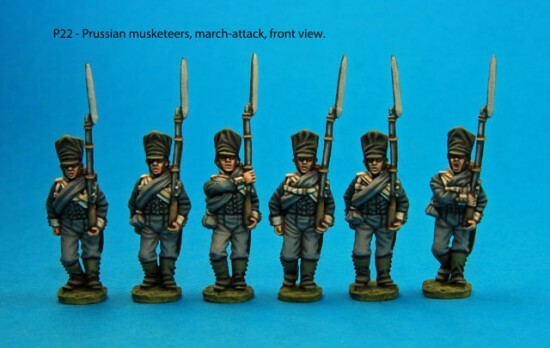 Pack P20: Prussian musketeer charging: drummer, standard bearer and NCO. Pack P21: Prussian musketeers charging – rear rank head variants. I think my favourite figure out of these 21 new poses is the drummer point the way with his drumsticks! Lastly, if you’re planning to order any of these packs, please note that Peter F. has moved to using a single letter P prefix for these packs now (following the example of using a single letter F for the French). I’ve been collecting up some links to new (and changed) places of interest for a while now. So, as well as adding them to the links, I thought I’d make a point of posting about them. Firstly, I’ve often followed the link to Mike Davis’ Horse and Musket website from Leuthen Journal but now he’s got a brand new blog as well and it looks like that’s where a lot of material will be migrating. It’s well worth a look at the galleries of commissioned painted Napoleonics if you haven’t done so before. Next, another blog that I’ve visited through a chain of links over the years is that of painter Dave Taylor. The reason for mentioning it now is that he has started work with some friends on a Napoleonic project called The Guns of April. This blog charts the group’s progress towards putting on a Salamanca demo game at AdeptiCon 2012. Good luck guys! And to round things out, here are the blogs of three people who are venturing into 28mm Napoleonic Prussian armies. Der Feldmarschall looks like an experienced wargamer who’s just starting on adding a Prussian force to his collection; Schrumpkopf’s Grossbeeren 1813 blog charts the growth of his army of Calpe figures and the highly interesting development that he’s commissioned Paul Hicks to sculpt some medical staff to tend his wounded; and, lastly, the cleverly named Prussian through the lead pile is first-time blogger Beardy Mike’s story of his switch from Games Workshop to Napoleonic Prussians. What strikes me about these three different blogs is the sheer variety of different approaches to the same army – not to mention that one author is in the UK, one in the US and the other in Germany. Yet our common interests bind us together!